Desperation in the Cusp of Madness. Cattaraugus County DA’s Ensell and Balcom are obviously getting desperate. In the latest twist of events Cattaraugus County assistant District Attorneys have been caught red handed filing fabricated in a local case. They could not fabricate just one piece, they had to fabricate two. 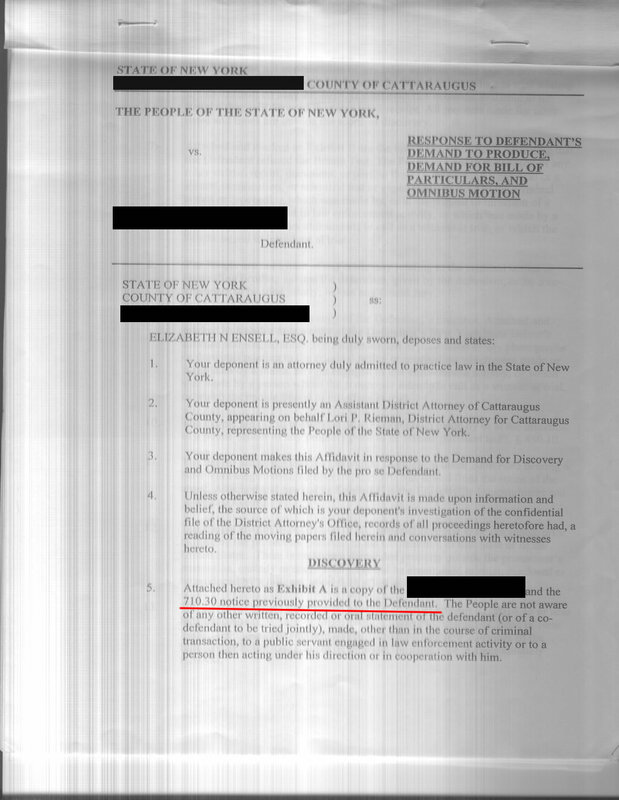 In New York if a suspect makes alleged ‘incriminating’ statements to a ‘law enforcement officer’ and they want to use it in court, they have to file a 710.30 notice within 15 days after the arraignment. 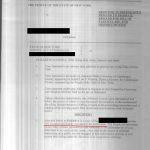 In the local case they not only failed to do that, they actually fabricated evidence to make it appear as if they did and then filed it with the court by claiming it was provided to the pro-se before their response was filed. They also claimed it was served, OK, then why is it not in the court file? When you are a Pro-Se litigant in Cattaraugus County you have to be very careful because when you start to expose the “powers that want to be” corruption they will stop at nothing to make an example out of you, including fabricating evidence. They will also enlist people who have been know to commit perjury to assist them, like Bryan H Schwabenbauer, a known perjurer. This is not the first time Schwabenbauer has filed false statements. 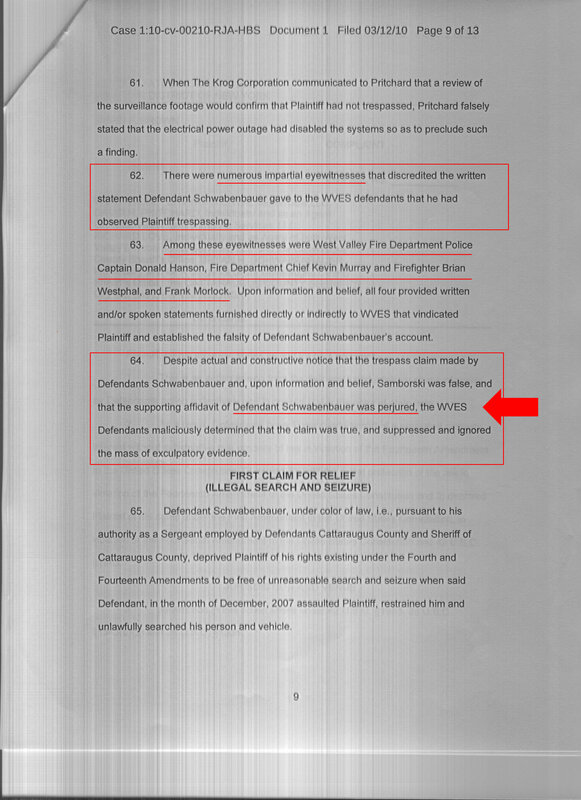 In a federal case, in which Schwabenbauer was individually named, he filed an affidavit that four other public officers testified to was a lie. Did Cattaraugus County do anything about it? Now, lets get back to the criminal activity of the Cattaraugus County District Attorney concerning the fabricated 710.30 notice. In her response to the Pro-Se’s omnibus motion, Cattaraugus County DA’s Rieman, Ensell and Balcom claim that the Pro-Se was “provided”, i.e. served a copy, of the 710.30 notice. This is a flat out lie. Can the Pro-se prove it though? So where is the proof that it is a total fabrication? You have to understand the nature of these types of evil people. They will stop at nothing to get what they want. 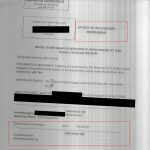 One of the most notorious methods is the slipping into or removing papers from the court file, fabricated evidence or otherwise, when the court clerk is distracted. That’s why when you ‘represent’ yourself always document what is in the file as soon as you can to ensure that things don’t just ‘magically appear’. There is no written statement attached, so it appears as is the DA’s are interviewing the individual(s) who allegedly heard the statements. So where are your notes on the interview DA’s??? It was never served to the Pro Se, the notice even ‘states’ that. It was never filed in the court case if it did in fact exist. Evil is as Evil does, it is the true nature of these things. When acting as your own ‘defense’ you have to document everything, video taped the court file to ensure that things did not “magically appear” or “disappear” in the file. In this matter, not only does the 710.30 notice not appear in the file, the accusatory instrument that it is mandated to be attached to shows no signs of any type of attachment ever have occurred. 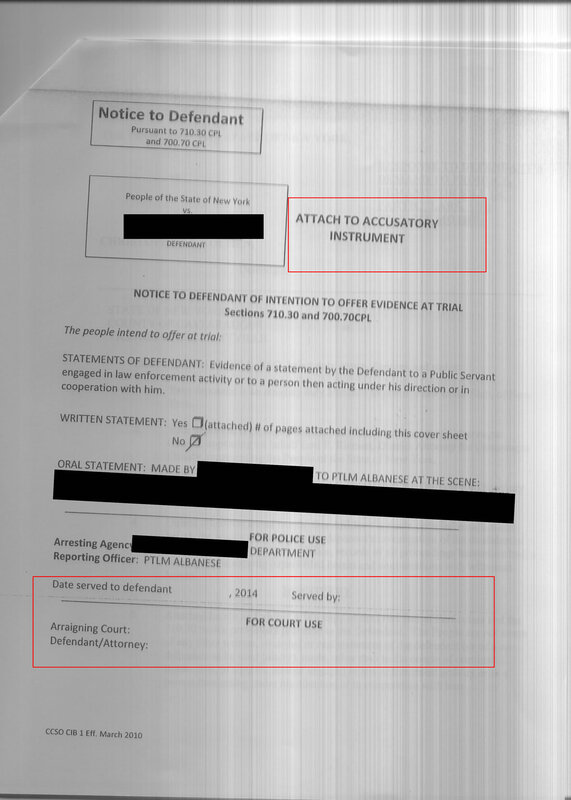 The accusatory instrument in this case being DCJS-3204 form. Below is just the DCJS-3204 with nothing attached to it. 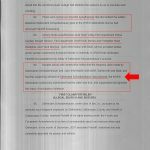 It is only a short video clip, however the full video reviews all of the papers in the court file and the notice (as well as the other document) are not found anywhere. These are just some of the tricks Ensell and Balcom will play both on pro-se litigants and the courts. How many more victims are there in Cattaraugus County who’s voice will never be heard? This entry was posted in Catt Co, Catt Co Important and tagged balcom, cattaraugus county, Cattaraugus District Attorney, corruption, district attorney, ensell, new york on September 21, 2014 by catcount.